I wasn't aware of that. Thanks for the correction. I'll look for that one. P.S. I amended my blog post. 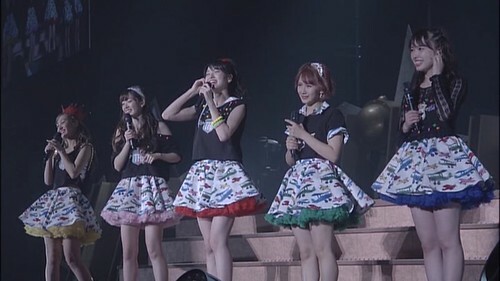 In the spring 2015 C-ute concert, “9 10 (Cute) Shunen Kinen C-ute Concert Tour 2015 Haru ~The Future Departure~” recorded on June 11, 2015 at Yokohama Arena, there’s a final MC segment just before the last song, “GameshaLIFE.” The segment ends with them all smiles, but when the song starts, Chisato is crying and so is MaiMai. 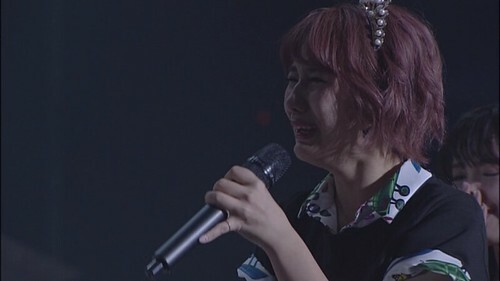 There isn’t a closeup of Saki for a minute or two, but when we do see her, she looks like she’d been crying also. Maimi and Airi are fine. Does anyone know what caused the tears? I initially thought it might have been the announcement of their disbanding, but that announcement wasn’t made for another year. Anyone know? 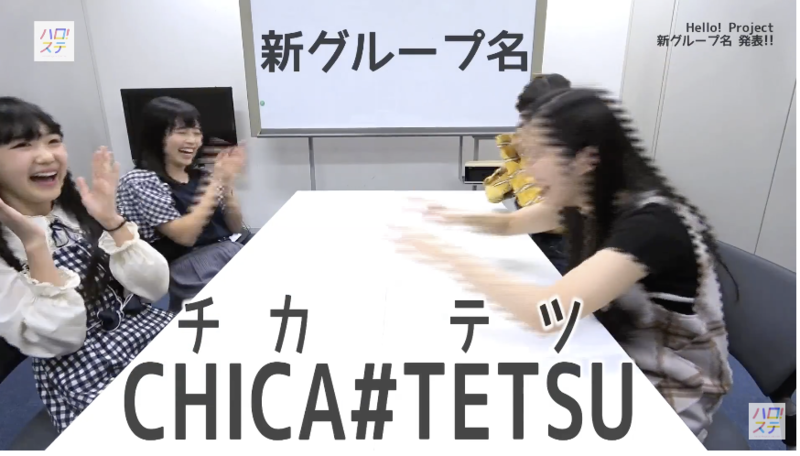 You know your procrastination is at its worst when you would rather watch a video on H!P T-shirts instead of getting ready for work but goodness these are bad. The fact that UF is proudly promoting these is cracking me up. ...I didn't know they were official. Wow. Wow it's an all time low. Bring back the color tshirts! The thing is, the concept isn't THAT bad. A bunch of throwback items in different member colors is a cool idea. But the execution is laughable. Absolutely laughable. But the font. Why would anyone put a font over the design like this in 2018? I saw Manaka Inaba perform "Midnight Temptation" with Ichioka, Takase and Kiyono last spring at Hina Fes. Manaka sounded off-key to me--in all four performances. 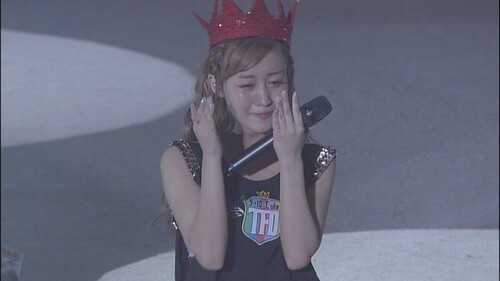 Last night I watched the DVD of the Morning Musume Premium from the event and she sounds just fine. Was it a problem with the audio on her mike or in the venue? I find that hard to believe, because they would have corrected it after the first performance and, besides, everyone else sounded fine. Did they tweak it in post-production or simply re-record it and dub it over? They definitely did some post-production editing to her mic feed, which is pretty common for H!P home releases. With the abundance of concerts getting streamed on tv these days, there are many opportunities hear the difference between the live airing of the concert and the following bluray. I think generally, the only releases you can expect the audio to go untouched on are either FC releases (birthday events, bus tours, etc.) or DVD magazines. Juice=Juice is out here killin' the game, guys. I wish all groups could have their quality of vocals. Also here's a few clips from Angerme's most recent concert, "10 People, 10 Colors" with a really fun mix of solos. I feel like Angerme will be okay but I’m not sure since I thought morning Musume would be okay after losing Sayu and I haven’t cared for them since. I just realized Mizuki is about 5 months short of reaching Takahashi's tenure as the leader of MM. I feel this on a deep level. I’m honestly trying to be excited about releases but it’s been bland lately. Oda is still entertaining to watch from a singing POV but overall it’s not Wow. I don’t know how to explain it. ANGERME and J=J is where most of my attention is these days. Juice=Juice is my favorite group now that Country Girls is what it is. But with Morning Musume, I lost a lot of interest not after Sayu, but after Riho. (I thought '15 was actually a pretty great year for them.) They've had some good songs since then, but I just find them to be a lot less interesting live. MizuSaku isn't a very charismatic, engaging lead. And they're not even bad, they're definitely on par with the strong girls of other groups. But in a group of 12-14 people, those are the two H!P puts value in, and they're not near enough to carry such a large ensemble. MizuSaku isn't a very charismatic, engaging lead. And they're not even bad, they're definitely on par with the strong girls of other groups. But in a group of 12-14 people, those are the two H!P puts value in, and they're not near enough to carry such a large ensemble. Yeah, especially since Sakura has a tendency to mimic the person next to her (like she did with Riho, at least singing-wise). Sakura and Mizuki are charisma vacuums, and as much as I like Maa, she's more of a wildcard than a personality you can depend on. The rest are straight filler. I've never cared less for MM than I do now. Even when I tired of the Platinum crew, there was still the realization that the core had talent. We're evidently seeing very different performers. I wonder how many of you have seen current MM live. They're all fantastic live, esp. Mizuki, Erina, Ayumi, Sakura, and Chisaki. And they're just as great in the concert DVDs. Masaki's probably better on the DVDs because we get to see her antics up close; they're liable to be missed if you can't see her well. The only one I have reservations about is Kaga. She does everything right and is always letter-perfect, but she rarely breaks character and lets her personality shine through. I want to see her relax a little. I've only seen them live at the NYC in 14 and at that point I was literally taken by everyone except Masaki. I know a lot of people say Sakura is lacking in stage presence and charisma but personally I see the opposite. I'd say I'm biased but it's one of the things that made her shoot up my rankings so quickly after she joined. To be honest I think there's a big difference between an actual live performance and watching the DVD of it. I was amazed by Juice=Juice and ANGERME when I saw them right in front of me - granted, I love their DVDs too since they're good performers in general, but I thought that even girls like Yuka, Nanami and Kawamuu sounded great despite not being the best singers. Probably got to do with the whole atmosphere and acoustics. She totally owned the stage whenever she was on at Hina Fes. The closest to a true diva in MM today, in the best sense of the word. Thank you Madara for pointing this out. I wouldn't pick exactly the same members as you, but we agree that Mizuki and Sakura are great performers, with real auras (and Sakura can also draw attention just by her dance, she became so good at it). 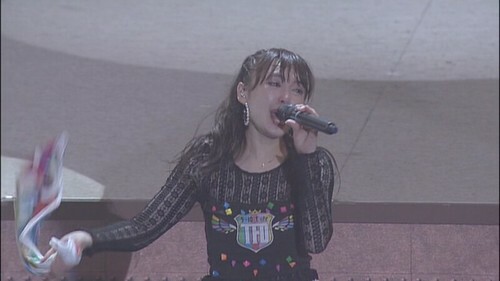 I would say you have to watch them a specifically during the lives to spot Ayumi and Masaki interesting moments, but when she is singing Masaki has also a very strong presence (and when she has the matching facial expressions, her dance makes strong impression). To me Miki can also be surprising when singing, and Maria has something, her energy, smiles and facial emotions gives her a certain kind of aura (when performing, not especially singing like Miki).